It was a sad day in work today as URRU Mallow closed its doors after just over two years of trading. The best olive oil in Ireland? Fruity, peppery, herby…and oh so fresh! 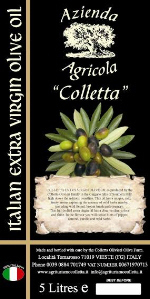 The latest batch of Colletta Olivieri Extra Virgin Olive Oil has just arrived and it’s irresistible. It is imported to Ireland by Lino Olivieri, whose family grow the olives down in Puglia, Southern Italy and also run the much-recommended Agriturismo Colletta Antonetta. Lino is the partner of my friend The Connoisseur so I’ve been hearing about his home, those olive trees and that oil for several years now. Only got a chance to look at yesterday’s Irish Times today and found Marie-Claire Digby’s article on foodie websites and food bloggers, which mentions some of my favourite Irish sites including greatfood.ie, icecreamireland.com, quirkykitchen.blogspot.com, englishmum.com – and Bibliocook.com! The Good Things Café in Durrus is holding a pre-Christmas Open Day next Sunday, 14 December, from 12 noon to 4pm. Its chef-owner, Carmel Somers, was one of the people that I interviewed for Foodtalk on Newstalk. We spent an afternoon talking about the time she first tasted limes in boarding school, heading off to Paris to work in kitchens there, cooking for Jane Grigson in London and how she uses spices with readily available Irish ingredients like turnip and cabbage.She is paired in the Spices programme with Arun Kapil of Green Saffron, which will be broadcast on Sunday 11 January. The cafe is in a gorgeous location, out on the Sheep’s Head Peninsula in West Cork, so it’s well worth a visit. There’s more information below. How could anyone resist bringing boxes and boxes of these home? I was just about to leave the supermarket (when travelling, I treat foreign supermarkets like museums – as a way of seeing into another culture – plus, there’s always chocolate) when I saw a display of these and I couldn’t resist grabbing a stack of them. Other than that, and several slabs of chocolate, I was rather restrained this time round.